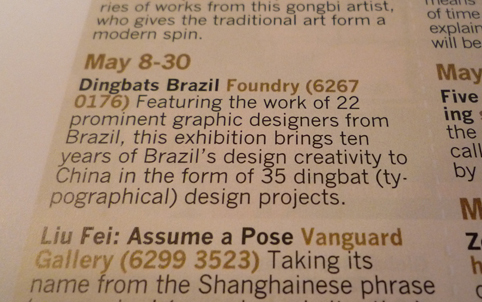 Make tomorrow night a Brazilian fair to sip some caipirinhas, listen to Brazilian tunes and check out the Brazilian dingbat exhibit by contemporary graphic designers at The Foundry. Dingbats are typographical ornaments or graphics. These dingbats are Brazilian digital symbol fonts that are unique art pieces combining two aspects of visual communication - illustration and typography. Originally, dingbats were ornaments used in metal typesetting. Nowadays, however, they have become a powerful communication tool, according to Bruno Porto, the curator of the exhibit Dingbats Brazil featuring 35 projects by 22 Brazilian contemporary graphic designers. "In the multilingual world, a symbol is worth a thousand words," he says. "They also help promote a country's culture in a light, economical and flexible way." A former director of the Brazilian Graphic Designers Association, Porto has been teaching visual communication at the Raffles Design Institute Shanghai since 2006. Since then he has been promoting Brazilian culture and arts in Shanghai. In 2007, he and his colleagues have organized "Discover the Brazilian Cinema," a Brazilian poster exhibition during the Shanghai International Film Festival. More than 30 Brazilian visual artists, including designers, illustrators, photographers and art directors, conducted a workshop with Chinese students to create the posters on display. Most recently, a seminar was organized at the Raffles Institute Shanghai to introduce selected projects from the 9th Brazilian Graphic Design Biennial, the biggest design event in Latin America. More than 120 industry insiders and students attended the seminar, which is the only official international event of the Brazilian Graphic Design Biennial in Asia. Porto and his colleagues are trying to bring the original exhibits, including posters, motion graphics, package designs and typography, to the city for the Shanghai International Creative Industry Week in October. On May 23, Porto will launch another exhibition, "One Year in Posters," at the Build, about 50 meters from The Foundry gallery. The exhibits, 12 posters, were created by Porto in 2008 to promote Brazilian visual arts events in Asia. They include the Brazilian Film Week in Hanoi, Vietnam, and a lecture by master cartoonist Mauricio de Sousa in Shanghai. They also serve as the artist's personal visual comments on a variety of happenings in China such as the Beijing Olympic Games. Type the characters you see in the picture above. DINGBATS é um ornamento tipográfico digital. DINGBATS is a digital typographic ornament.